Style: Nadia Aboulhosn X boohooPLUS. The newest blogger collab on the scene is Nadia Aboulhosn for Boohoo. Having teamed up with them last year to model some of her favourite picks, this time she has designed a capsule collection for the fast fashion brand. I've picked my favourite piece from the collection and styled it up in a Kim Kardashian style, classic white and camel combo. I chose the Embossed Sleeve dress in crisp white. I'm wearing the size 24 as I always find Boohoo a little on the small side fitting wise. I'm glad I did because lets face it, there is nowhere to hide in shiny white material! This dress, does come up more like a tunic on me, so I teamed it with leggings for my own comfort and modesty. There is a zip detail to both sides which adds a bit of interest. I'd have like to have seen the embossed sleeves to have been a bit more prominent as you can only really see the detailing if they catch the right light. But for a budget piece of fast fashion, it's a cute piece that will certainly add a bit of interest to your wardrobe. 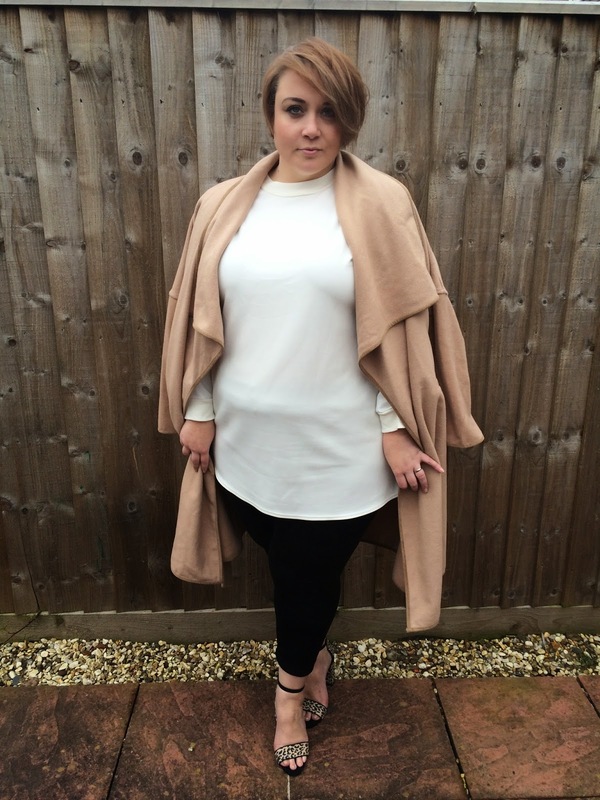 It's so great that we're seeing more and more blogger lead collections, especially in the plus size world. We've waited a long time for a fun injection of trend lead pieces. Long may it last! I really like the tunic. I thought it would be expensive but its not! I think ill have to get myself one. 😊 Teamed up with the camel coat it looks fab. Love how you've styled this piece - very swish!